Rubino’s is an Italian marketplace located on Chicago’s Southside in Tinley Park. They are a full Italian market and deli and offer several homemade items including Italian sausage, roast beef, and more. They have been in business since 1994. 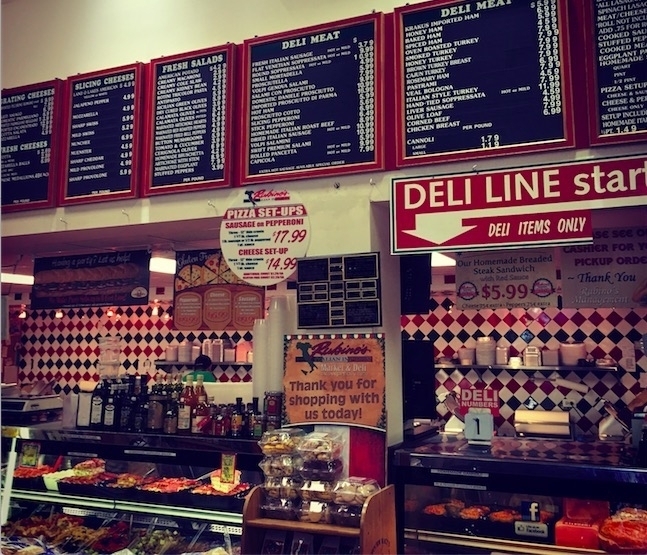 Rubino’s was featured on Chicago’s Best as a “Best Deli”. A featured item is their breaded steak sandwich. We set out to order one and review it. Chicago has world renown breaded steak sandwiches including Ricobene’s and Fabulous Freddies. We ordered our breaded steak sandwich from Rubino’s and we’re very surprised by the enormous size of the sandwich. It was 1 foot AND some. It was also bulging in girth. We ordered our breaded steak without peppers or cheese. We just had it with the red sauce. The sandwich smelled outstanding. On first looks, the red sauce was very dry on the steak. You can see most of the steak not covered in sauce when we opened the sandwich up. There was tons of breaded steak – TONS! It was too much for the sandwich – we picked out a lot of the steak and ate it on the side. We were disappointed that the bread didn’t have any butter or garlic on it. The bread wasn’t toasted either. The bread was also a bit tough, as it was probably sitting out most of the day. Because of this, we didn’t feel the bread made any contribution to the sandwich and we only really tasted steak. A couple of bites our steak was very dry and made it slightly tuff.